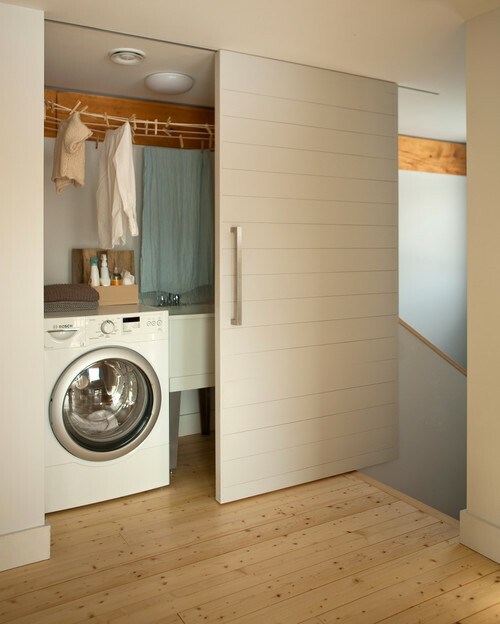 Maine designer Riley Pratt estimates that the average energy bill for his home is less than $20 per month. And that’s including the $10 a month he pays just to have service. To put that into perspective, the average homeowner in Maine spent $2,949 on energy in 2009, according to the most recent data provided in the U.S. Energy Information Administration’s Residential Energy Consumption Survey. So how does Pratt achieve this in a state where temperatures regularly dip below 20 degrees in winter? By harnessing heat gained from sunshine. Pratt’s house, designed and built by his colleagues at architecture firm GO Logic, is based on Passive House standards, which were developed in Germany for assessing the energy efficiency of buildings. 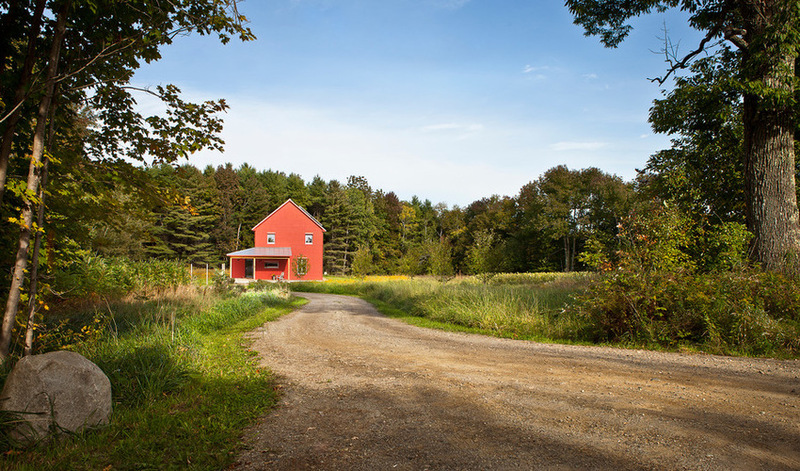 The house sits in a 3-acre field on a cresting hill about a mile outside of Belfast, Maine. It is oriented with the sun’s winter path in mind to receive the most heat from it during those months. 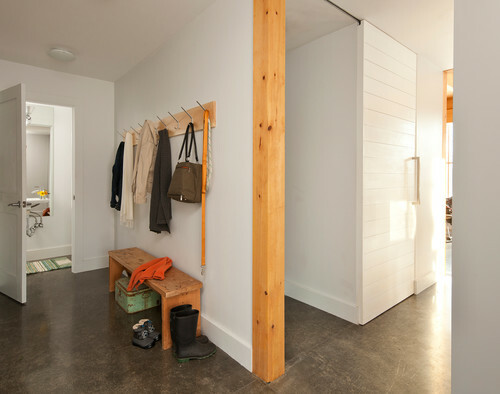 A primary principle of Passive House standards is a compact building form. 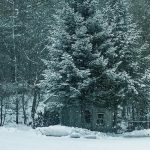 The goal in a cold climate is to reduce heat loss through the building’s shell, something that’s ideal for places like Maine. It’s simple: Sun shines through the windows, strikes a surface and warms it up. The house then traps that heat inside with a virtually airtight design gained through walls, a roof and even a floor that are superinsulated. Here structural insulated panels (SIPs), made of thick foam sandwiched between two layers of OSB, cover a frame made of 2-by-4s. The roof is loose-fill cellulose (basically chopped-up newspaper) to a depth of 2 feet, covered in a standing-seam roof for durability. 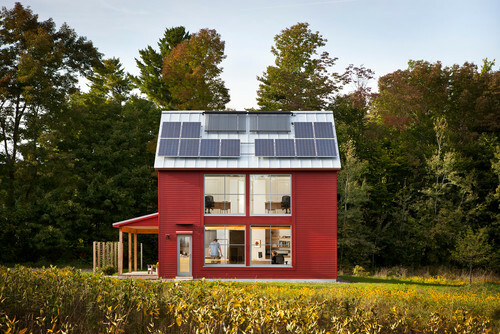 The exterior is fiber cement clapboard intended to reflect a traditional regional aesthetic, in a deep red that speaks to a common New England color palette. The panels on the roof in the middle are for the solar hot-water system. A copper element inside a vacuum tube absorbs heat from sunshine even on cold days. The heat is exchanged and carried into the house to indirectly heat a 120-gallon hot-water tank. Solar hot-water systems like these cost around $10,000. Various tax incentives and rebates offered in numerous states sometimes significantly offset the upfront cost to install them. Pratt says the investment pays off in five to seven years, depending on usage. Solar photovoltaic panels also help offset electricity costs. 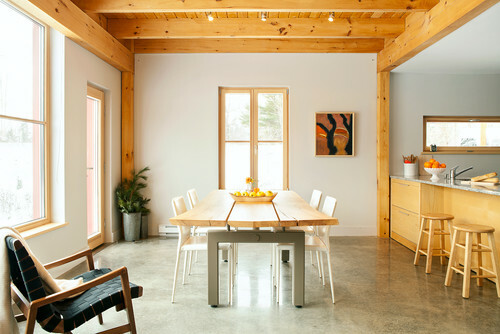 The house isn’t net zero, but it’s close. A common misconception is that solar photovoltaic panels directly power the house and the electronics inside. The sun shines and the computer works etc. A more common installation works more like a credit system. The power generated goes to offset your bill as an energy credit. With grid-tied systems like this, you don’t make money producing energy; rollover credits go into your account and accumulate on an annual basis. The house shell (which cost about $170 per square foot) basically sits on a raft of foam insulation underneath. A concrete slab was then placed inside the house envelope to help regulate the internal temperature. The slab can absorb a lot of heat before warming up, then loses it slowly, helping to regulate the internal temperature. “It says cool in the summer and stores heat in the winter,” Pratt says. It’s basically an airtight structure, with a ventilation system that’s constantly running. A “magic box,” as Pratt calls it, in the attic pulls fresh air in while exchanging heat that stays inside. “Stale air goes out; fresh air comes in. The heat energy of the exhaust air is exchanged with that of the incoming air. The volume of air in the house is refreshed about every two to three hours,” Pratt says. The dining room, living room, kitchen, mudroom and powder room are on the ground floor. The kitchen is an Ikea base with custom ash details. There are three bedrooms on the top floor. 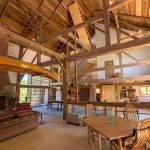 Locally sourced timber pine posts create a hybrid timber- and stick-frame structure. The floor is a single layer of tongue and groove spruce. The certification process is a benchmark for energy consumption, developed in Germany about 20 years ago. It will be the standard in Europe for many building types in the near future. 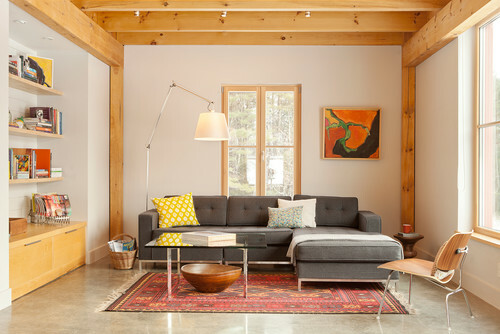 In the U.S. only 13 homes have been certified to Passive House standards. I would love more information on SIPS. Do you have any more information?